Yoga Science talks about surrendering and letting it all go. Intense Side Stretch Pose is all about letting go by getting deeper with the stretches. A simple yet significant forward bending pose from the Ashtanga Yoga Series, it is known as Parsvottanasana or the Pyramid Pose. ‘Parsva’ means ‘Side’, ‘Ut’ means ‘Intense’, ‘Tan’ means ‘to stretch or to extend’, and ‘Asana’ means ‘Pose’. Bringing the focus of the mind and body inwards, it is known to have a calming effect along with strengthening and stretching the lower body and the back. Many yoga practitioners use this pose as a part of yoga for runners series, stretching the body, recovery, strengthening the lower body, etc. Let us understand the step-by-step procedure of performing Parsvottanasana Yoga along with understanding the benefits of Parsvottanasana, modifications, and contraindications. Step 1: Stand in Tadasana at the top and center of the mat. Now, take a step back or jump slightly to place the left foot 3 to 4 feet apart from the right foot. Ensure that both the heels are in line with each other. Place the back foot or the left foot at a 45-degree angle, while the right foot faces the front. Step 2: Turn the torso to face the front (in the direction of the right foot) and try to square the pelvis so that it comes in the front line of the mat. if the back heel lifts, try to keep all four corners of the heel grounded onto the floor. Lengthen the torso and imagine a long line flowing from the tailbone to the lower back, the upper back, and flowing through the head and is going to the roof, in order to keep the spine erect. Step 3: Now, start bending from the hip joint towards the right foot to the first. Bring the torso parallel to the floor. Once the torso is parallel to the floor, place both the hands on either side of the right foot and fix the gaze forward. Keeping the gaze forward, adjust and press the right thigh to gain extra length in the torso. Ensure that the hips are squared and facing the front of the mat because the right hip may swing towards the left hip instead of be staying in the center to create more comfortability in the body. Don’t let that happen. Gently bring the pelvic region to the front every time it sways. Step 4: Moving forward in the pose, bring the torso further down to rest the chest on the top part of the right thigh. Slowly place the nose and forehead on the right shin. Both the hands will get wrapped behind the back in a manner that both the palms face each other. The fingers are joined in Namaste Mudra or the Prayer Position. The shoulders are drawn away from the ears while the shoulder blades are drawn towards each other. Step 5: Hold the pose for 3 to 5 breaths. In order to come out of the pose, unwrap the arms and place them back on the floor on either side of the right foot. Bring the torso back up first parallel to the floor and then start raising it to the top and to the starting position. Step 6: Bring the left leg back to the front and place it in line with the right foot to come back to the starting position, Tadasana. Perform the pose on the other side with the same steps. Use yoga blocks to help achieve a better and a cleaner form. Place the blocks on either side of the right foot (vice-a-versa) and place both your hands on the block. Start by vertically placing the blocks. Keep them horizontally and finally remove them completely. Those practitioners who find it difficult to place all fours off the back heel on the floor should practice placing the heel on the wall and try to press it against the wall. This will create a sense of understanding on how to keep the heel fixed and grounded. Beginners can initially keep the hands on the waist and not warp them behind the back to form a Namaste Mudra and gradually work their way into the Parsvottanasana to form the Mudra. Also, those with high or low BP conditions should not go all the way to the last step. Instead, they can perform Ardha Parsvottanasana, where the practitioner performs only till step 3. Women should not perform this pose during pregnancy because of the position of the core. 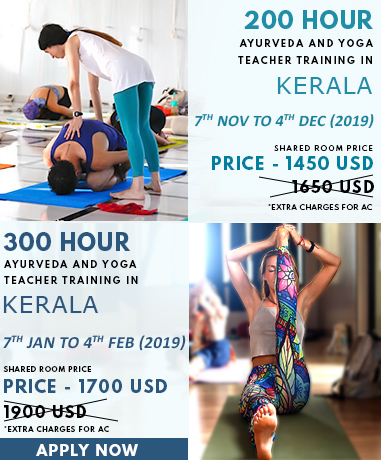 To know about Parsvottanasana in further detail, explore our Yoga Teacher Training In India.